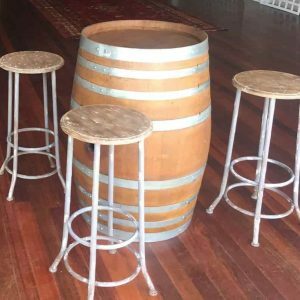 Vintage French and American oak Wine Barrels originally used in winemaking have been expertly refurbished to bring out their naturally stunning, timeless look and feel. Our Wine Barrels are hand-selected and of the highest standard in the market. The barrels have been refurbished to bring out the beautiful characteristics of the oak and original markings. We guarantee that you will be pleased with our high-quality barrels. 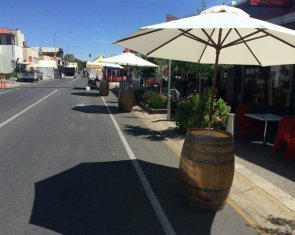 They also have slots in the middle for the 3-metre span umbrellas to be completely secured and safe for windy and rainy weather conditions. On sunny days, the umbrellas provide a fair amount of shade and are very popular for outdoor events in parks, streets, large backyards and weddings on large country estates and farms. 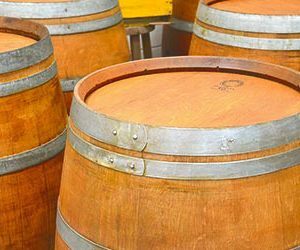 American oak and Vintage French wine barrels refurbished to bring out the timeless classic appeal. 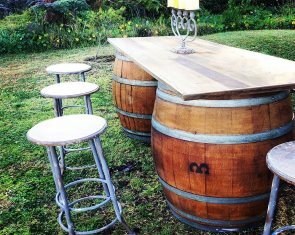 Rustic Reclaimed Wooden Bar Table with 2 Vintage Wine Barrels.